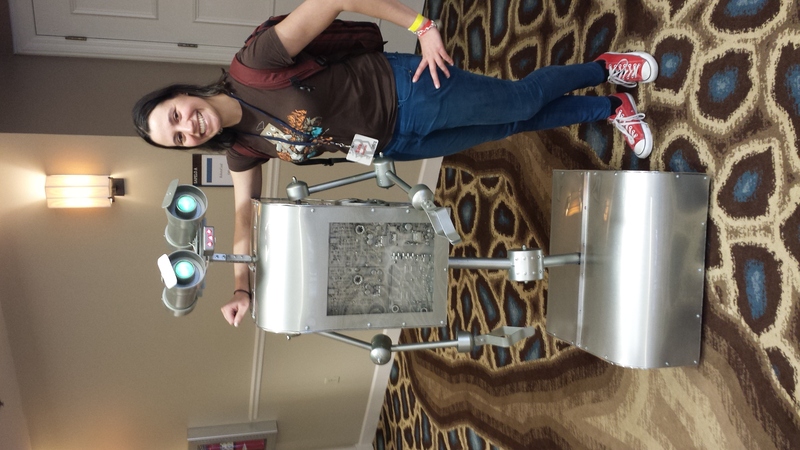 Over the weekend, I was fortunate enough to find myself in lovely Amelia Island for the first-ever RobotsConf! It was a two-day marathon, aimed at taking software developers and teaching them everything there is to know about the maker movement. It was amazing. I learned so much and met so many wonderful people, I already can’t wait for next year’s conference. The first day was focused on talks on education. This was in the form of a variety of “surveys”, to give an overview of and inspiration for all the different things we’d have the opportunity to try during the conference. The talks ranged from electronic fundamentals to 3D printing, and home automation to hackerspace creation. After the talks, all 150 or so of us moved next door to the weekend’s hackerspace. There were plenty of components for building robots, including soldering irons, 3D printers, and laser cutters, and we could build, learn, and talk to our hearts’ content. 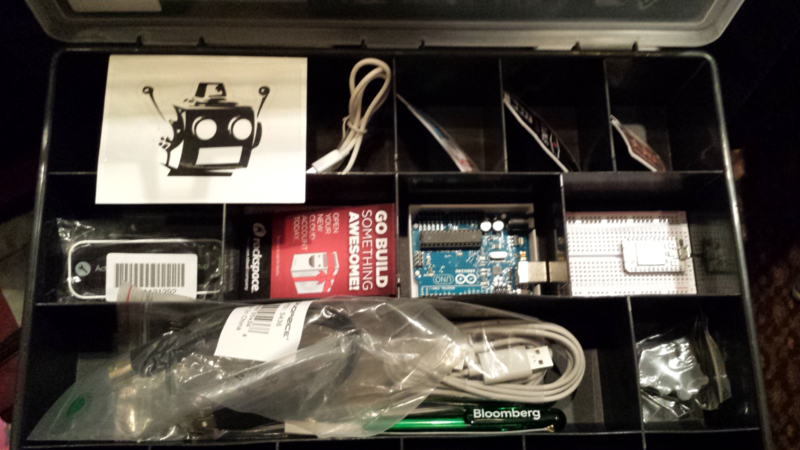 We also each got an electronics kit with some useful items to get us started. Taking a step back for a moment, most hardware projects use Arduino, Beagle Bone, or some other microcontroller like the Spark Core. As a programmer, you can tell the microcontroller to turn pins on and off. Various inputs and outputs are connected to the pins, and you can use the levels of current flowing and the numeric value of data received from inputs to make a robot react to various input. Traditionally, robotics has fallen to the realm of languages such as C. However, in more recent times libraries have been built which allow common web-based languages to control hardware too, through the serial port. Even more recently, developments have been made which can let you do this wirelessly. Raquel Vèlez gave a wonderful talk at last year’s JS Conf that goes into what this new level of accessibility means for robotics and why it’s so amazing. I recommend watching it. I have used Johnny-Five in the past a few times, mainly playing with LEDs and making an auto-firing Nerf gun. It’s been wonderful, and it’s a fantastic library, but since I’ve been so immersed in Ruby I wanted to give Artoo a try. I managed to make an LED blink, and control a servo with a keyboard. The most exciting part of the conference was the science fair. There were a bunch of amazing projects that people and teams pulled together over the course of just over a day. One team had a robot play musical water glasses, controlled by a Leap Motion, which captures hand guestures in the air. 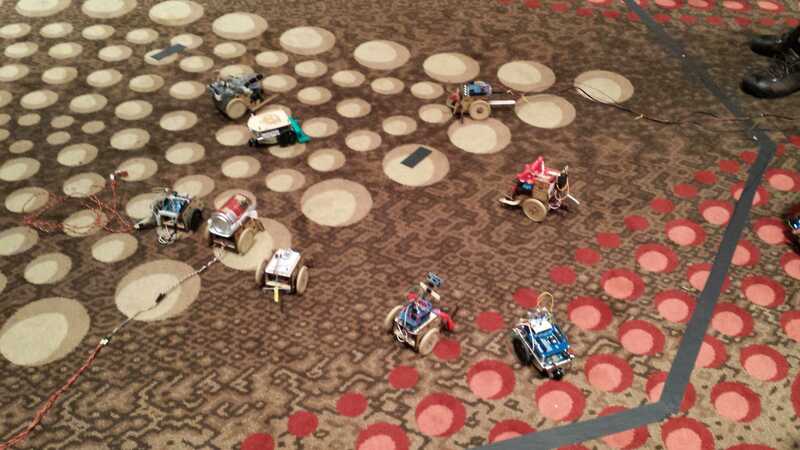 A few people made Battle Bots, and had them enter a sumo competition. Another made a robot arm out of popsicle sticks and servos, and was able to control it with pinpoint accuracy by using the Leap Motion. 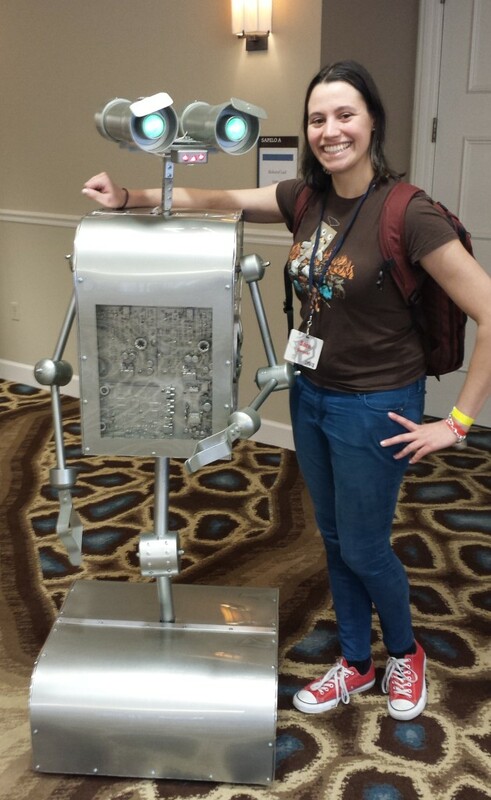 Someone else made a robot strum a makeshift guitar made out of rubber-bands, with the robot controlled by a Kinect. 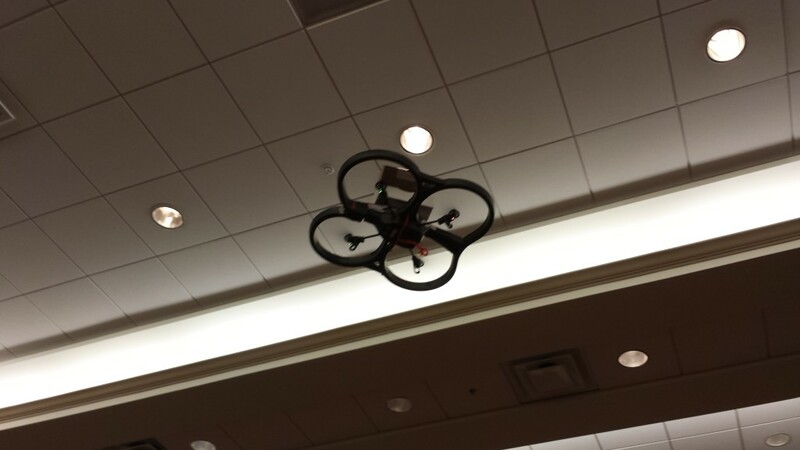 A few people hacked Parrot AR Drones, with hacks ranging from combining them with a Spark Core to include a grasping claw, to flying them with an Oculus Rift. The entire conference was amazing. The best part is that I’m able to take the knowledge I gained there and bring it home with me. I left already starting to plan a robot project to do at home. I came back to New York feeling inspired, and glad that I had the opportunity to meet so many amazing people (and robots).